E.T. was a big name at the 1983 Oscars, nominated in nine categories, winning four of them. It took home Best Sound, Best Music, Best Sound Effects, and Best Visual Effects, but failed to capture Best Picture, Best Director, Best Original Screenplay, Best Cinematography, and Best Editing. So you could look at this movie as a technical marvel but not a cinematic one, but that would be ignoring the fact the Gandhi swept up nearly every award, taking far more than its fair share perhaps, leaving E.T. in its dust. But I doubt there are many left after all these years who won’t give this sci-fi masterpiece its due credit as both an original work of art & a stirring story. E.T. has more to offer than just cool visuals, which is why it’s still seen as a pillar of Hollywood magic more than 30 years later. As an alien race conducts a nighttime visit in the hills surrounding an L.A. suburb, one of their kind ventures too far away from the mother ship, curious about the local wildlife, fascinated by this beautiful green planet. But when mankind hurries to investigate the strange lights in the woods, the aliens are scared, quickly flee, and unfortunately leave one adventurous young creature behind. That creature will become known as E.T. after he is discovered by a small boy named Elliott. E.T. & Elliott form a bond that goes beyond friendship, surpasses love, and morphs into something that connects them. Their thoughts, emotions, and even their health join together, making their inevitable parting that much more difficult. Building on the massive success of Close Encounters of the Third Kind, Spielberg made a similar sci-fi drama with E.T., this time relying more heavily on emotion & character, less on dark suspense. This time we got an alien encounter with heart, not just science, and it blew American audiences away. 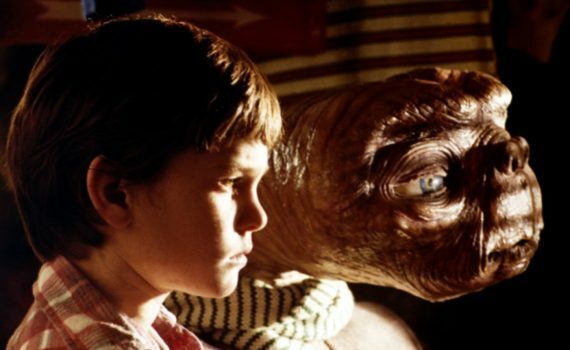 Instead of a boy & his dog it’s a boy & his alien, but the deep loyalty is still there, and I’m sure many eyes were watering during the grand finale of this film throughout the years. It’s a great story, shot excellently, with some of the greatest theme music you’ll ever hear. Sure the acting isn’t wonderful, akin to Return of the King, but it doesn’t really matter, the movie is just too enjoyable to deny. And I love the where-are-they-now game that’s intrinsic to this film: Thomas never took off, McNaughton really never took off, Barrymore is a household name, Tom Howell (The Outsiders, Red Dawn), Erika Eleniak (Baywatch, Under Siege). E.T. is a classic, a foundation, a sci-fi great, a heart-warming tale, and a must-see for anyone who claims they love movies.